I love everthing about this look...the pick a boo croped top, the simple white skirt, the shoes and the bag. You have styled it perfectly. I love your crop-top, sunnies, and bag! That top is fantastic, Nicoleta! The bag too! In love with that top! Gorgeous! Your top is so perfect!! What a pretty cropped top! Love it. Molto carino l'outfit e tu sempre bella ! bellissima la tua gonna, Nico! I fell in love with the Zara heels when I saw it, and now you have it! Woooow I love this outfit!!! So funky and cute ! Love that crop top!!! Stunning!!! This outfit is amazing dear! Love the bag!! Un look muy original, muy guapa. Nicoleta me encanta el look, estas guapisima!!! I love that top, you look great. Nicole, You encouraging me to wear socks. I've always liked them with my heels, but I'm always scared to try. You look incredibly amazing in this outfit. on love with your top! Ahah mi sono immaginata la reazione di tua mamma! :) Molto carini sia il top che la borsetta! Un bacione Nico! Wow, gorgeous my dear, so so so chic! Amazing outfit, edgy but chic! Mi piace tutto di questo look. I calzini da portare con i tacchi li trovo incredibilmente chic! Very stylish! I actually like the neon orange pop of colour you added to the outfit, xoxo. I do like that top, so original...and I muss say that I also adore heels with socks...besides being comfortable, it makes me feel playful! but yes a lot of people don't think it's cute, your mother is not an exception. Woah! That top is amazing! And I love how you manage to make something with 'bugs' on it look super chic! 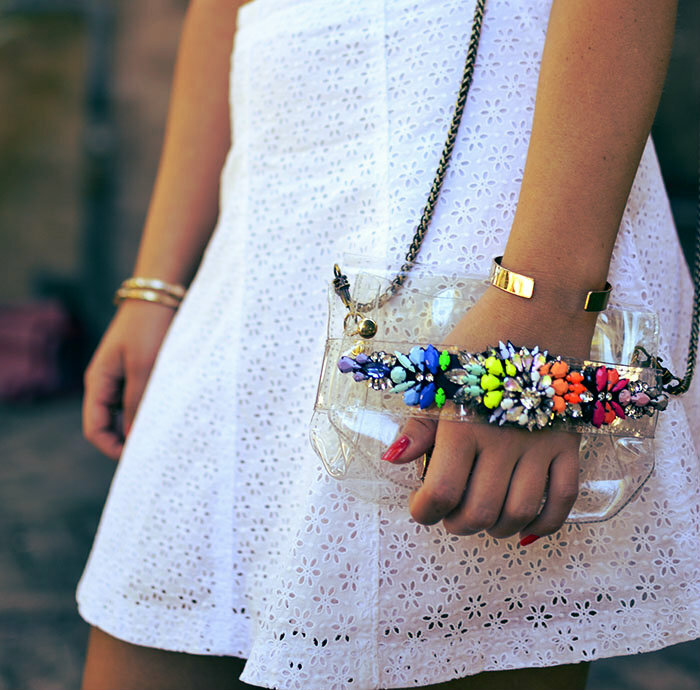 Also the transparent clutch bag is a must want for me!!! It's almost like a piece of jewelry! You look as stunning as ever girl! coooooooooooooooool!!!!!!!!!!!! I never seen something better!!!!! geanta, sandalele, sosetele....totul arata atat de bine!!! Love top and print...very very nice look Nicoleta!!! I am in love with that top !